They called ” it went Viral” with a record of re tweet of 2.7 million . The re tweet broke the record for most re tweets, also it caused Twitters servers to crash temporarily due to the sheer volume of traffic. It had easily broken the previous record set by President Barack Obama of 781,000, posted at the time of his re-election. Within an hour, the DeGeneres tweet had claimed over a million retweets. The Oscars host later said that Twitter had temporarily crashed because of her actions and added: “We really just made history. We’re all winners tonight.” Come the end of the ceremony, the figure stood at 2,070,132. Hangover famed Bradley Cooper clicked this photo. Ellen twitted . ” It will be good that Bradley should have had little longer arms”.. In the photo were included the Hollywood stars Jennifer Lawrence, Channing Tatum, Meryl Streep, Julia Roberts, DeGeneres, Kevin Spacey, Bradley Cooper, Brad Pitt, Angelina Jolie, Lupita Nyong’o and her brother. This program was aired on Sunday for The Academy Awards. It is kind of taken that the program is boring and has useless fillers. However,Ellen DeGeneres infused life by her ever interesting chatter. As told above a part of her hosting duties she was being genuine to the sponsors Samsung for promoting their smartphone Samsung Galaxy Note 3. 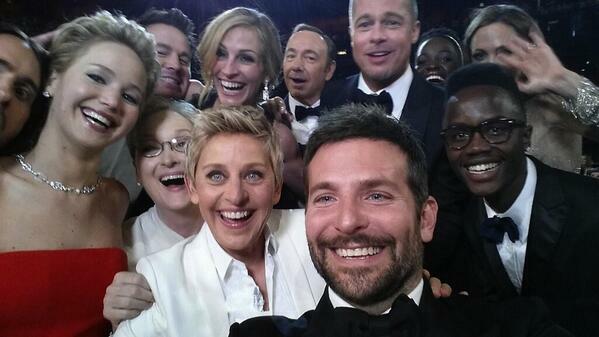 Initially the selfie was with Meryl Streep but soon expanded with other famous Hollywood actors. She shared the snap by tweeting to achieve the record breaking numbers.